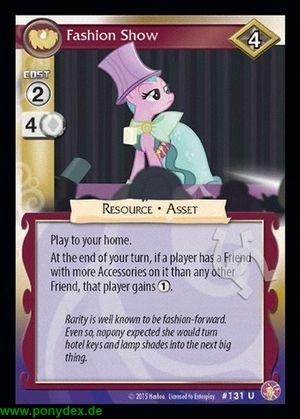 At the end of your turn, if a player has a Friend with more Accessories on it than any other Friend, that player gains 1 action token. Rarity is well known to be fashion-forward. Even so, nopony expected she would turn hotel keys and lamp shades into the next big thing.